Arutz Sheva takes you on a visual tour of the Sialuai Air Base, which belongs to the Lithuanian Air Force. Last week leaders of the EU met with Vladimir Putin in an effort to strike a deal for a ceasefire on the ongoing fighting in Ukraine. Next door, literally, in the Baltic States of Lithuania, Latvia and Estonia, NATO was on high alert. Over the past month the Russian Air Force has been continuously testing NATO’s air defenses in the region from the North Sea to Albania. The Baltic States joined the EU in 2004, since the EU was and is interested in bringing these countries and their infrastructure into the 21st century. NATO provides these states with a military umbrella so that most of Lithuania’s (and its Baltic neighbors) gross income can be funneled into modernizing the country before allocating a significant budget towards investing in a military buildup. NATO operates a contingent of fighters from usually two nation states in three different bases in the region. The contingents that operate report back to NATO through the Combined Air Operation Center in Uedem Germany. We were invited to Sialuai Air Base which belongs to the Lithuanian Air Force to cover the deployment of two contingents – the Polish and Italian Air Forces. The hosting of journalists by the LTU AF is impeccable and is something that even though their Air Force may not be a leading combat air force – when it comes to PR it is apparent that they easily supersede most air forces in the world. The PR section has coordinated interviews with crew members from both nations participating as well as coordinating a very complex media flight on patrol in the Baltic skies involving 3 air forces simultaneously. The professionalism shown in coordinating this event is something other air forces around the world can only be jealous of. We start off with the Italian side of the base and their state of the art European built Typhoons. Russian aircraft flying to Kaliningrad rarely if ever file a flight plan, and this causes every flight on the route between mainland Russia and Kaliningrad to become an unidentified flight, even if its sole purpose is to deliver supplies (as opposed to Electronic Intelligence aircraft which often probe NATO defenses as well). The Russians use this tactic to try to both wear out the forces on call as well as cause them to become complacent. The rotation serves to keep NATO forces sharp, for every rotation, and many NATO air forces compete for the opportunity to serve as an Air Policing Force. For some European forces, this is the highest level of operational service they can aspire to. These rotations serve well to test the whole aspect of the forces’ capability, from the ground maintainer to making sure the plane is ready at a moment’s notice all the way to the pilot making the intercept. For one of the Italian pilots this is his first intercept, and you can feel his excitement when rushing to confer with the two other pilots tasked with the mission. For aviators, this shows that constant drills and training pays off when the time comes. When asked if he finds the Russian pilots to be aggressive Col. Bertoli stated that from his experience the Russian pilots behave professionally and follow a certain expected etiquette when being intercepted. This behavior is consistent among intercepts the Italian contingent has encountered. Col. Bertoli was extremely proud that this air policing mission puts the Italian Air Force as the only Air Force to have performed all four air policing missions NATO tasks its forces with, the four being Iceland, Albania, Slovenia and now the Baltic states. As part of maintaining their readiness, routine drills are planned by NATO headquarters in an effort to measure the contingent’s readiness. The Italians seem to be driven to prove that they were born ready for action should they be called upon and coordinate training exercises over and over while we are there. From the Italians we transport over to the Polish contingent. The Polish Air Force sent over four Mig 29 fighters. These aircraft were recently upgraded by Israel Aerospace Industries (IAI) and as one of the Polish combat aviators remarked, “We can finally see where we are and what is going on”. The 1980s-style technology the Migs deployed in previous missions is gone – the systems implemented include a multifunction color display, mission computer, INS/GPS navigation, up-front control panel, digital video recorder and database, plus a Rockwell Collins RT-8200 UHF/VHF radio. WZL-2 also provides a new briefing and debriefing system, developed in conjunction with IAI's Lahav unit. This upgrade has essentially “kicked” the aircraft into the 21st century and makes it easier when tasked by NATO Command for missions. 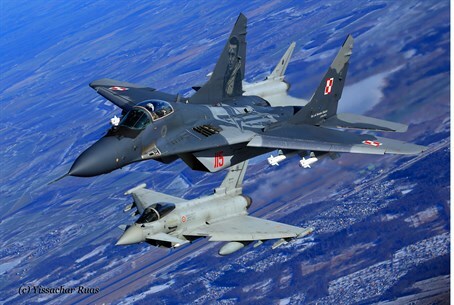 The Polish Air Force intends on keeping the Mig 29 in service until at least 2025 following this upgrade, and although it has much more technologically advanced aircraft such as the F-16 Block 52 the durability and flexibility of the Mig 29 speaks for itself. The growing sense around the Lithuanian Air Force as well as NATO is that the times are changing. Russia is looking to expand its influence over the states bordering with it and this has the Baltic region at a higher sensitivity. Unrest in the Ukraine is something these nations are watching very carefully. Lithuania along with the Baltic region is building a young, independent and fledgling democracy, something that comes at odds with the recent transformation Russia is undergoing. The actions decided by Western Governments regarding the Ukraine will no doubt have an impact for better or worse on if the Baltic Region continues to remain independent and democratic. Special Thanks to the Lithuanian Air Force, its Commander, NATO, and the individuals involved , Magic, Ice, Peppe and one very special woman who made it all happen.